Jessica Simpson Confirms She is Pregnant Again! The rumor mill has been churning for weeks regarding a second pregnancy for Jessica Simpson. On Christmas day the star finally confirmed it. Simpson, 32, is pregnant again! This will be the second child for Simpson and her fiancée, Eric Johnson. Jessica, who has now become a seasoned pro at the baby announcements, took to twitter to share the good news. 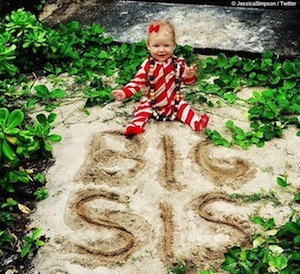 Her daughter Maxwell, 7 months, is pictured sitting up with the words 'BIG SIS' etched in front of her in the sand. Simpson included the message, "Merry Christmas from my family to yours!" in the announcement. Simpson recently reached her goal of 50 lbs. weight loss, following the birth of her first child. The weight loss was part of a 4 million dollar deal she holds with Weight Watchers. Congratulations Jessica, Eric and 'big sis' Maxwell!